Gracing the grand festivity are celebrated music icons from ASEAN member states, headed by modern-rock outfit D’Hask of Brunei Darussalam, indie pop duo Nimith and Sophea of Cambodia, classically trained pop songstress and violinist Mia Ismi Halida of Indonesia, alt-rock band Sack Cells of Laos, ethnic ensemble Nading Rhapsody of Malaysia, pop superstar Eint Chit of Myanmar, jazz-fusion act Asia 7 of Thailand, and pop-rock darling Tuan Anh of Vietnam. Our very own Parokya Ni Edgar, Franco, Silent Sanctuary, The Ransom Collective, Ben&Ben, and Sandwich will also represent the country with their respective brand of contemporary, alternative, rock, and indie music. Aside from the individual performances, the participating music acts will take part in performing the rearranged version of ASEAN Spirit—the theme song for the Philippines’ ASEAN Chairmanship that coincides with the 50th Anniversary of ASEAN this year. 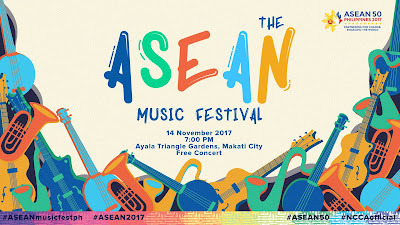 2010 Ms. Universe 4th runner up Venus Raj will be joining the ASEAN Music Festival 2017 as host. The renowned beauty queen, which finished fifth in the Ms. Universe pageant, will walk through various musical and cultural highlights of the ASEAN celebration from past to present. The music festival is expecting more than five thousand attendees. Guidelines will be implemented on entry and exit points to ensure the security of the audience and the performers. For more information on the concert guidelines, please check/follow our event page: bit.ly/aseanmusicfest2017, and contact us at 0956-591-3367.